The leading source for stairlifts. Start enjoying your home again! Whether you install it yourself, or have it professionally installed, the key is to begin with proper measurements. It really is very easy to measure for a stairlift. All you need is a tape measure. Take a general overview of your stairway layout and decide which side of the staircase the stairlift will be mounted on, when viewed from the bottom. The lift may be mounted on the banister side if desired. No wall is necessary as the stairlift mounts to the stair treads, not a wall. Be aware that the stairlift rail will overhang the top landing by approximately 6″ and meet the floor at the foot of the stairs approximately 14″ beyond the nose of the first step. All measurements should be recorded in inches. 1. The most important measurement is marked as #1, Overall Length, on our guide below. This determines the length that we cut your rail for the lift. To obtain this measurement stand at the top of your stairs, extend your tap measure until it is laying on all the stair treads and the tip of the tape measure is touching the landing at the bottom of the steps. 2. Next measure from the edge of the top step to the edge of the first step. Mark this in block 2. 3. Next, measure the width of your staircase and enter the measurement into block 3, marked Staircase Width. 4. 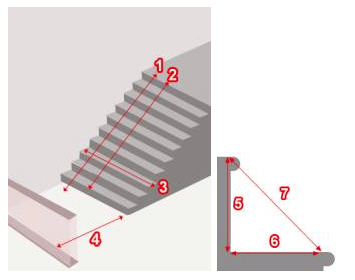 If there is a wall or a door at the bottom of the steps as illustrated as 4 on the diagram below, please measure from the bottom step to the wall. 5. The last three measurements (5,6,7) will enable us to preset the seat angle of your lift at the factory. Please measure each according to the diagram and enter the measurement results in the appropriate boxes. Looking up from the bottom, which side of the stair case will it be mounted on? Need a quick price quote? Simply fill this out, and it’s on the way. *Note: We will not sell or rent your information to any third party. StairliftNOW is dedicated to delivering fast and courteous service when you need help the most. We promise to promptly respond to your request. You love your home. You shouldn't have to move because of your stairs.